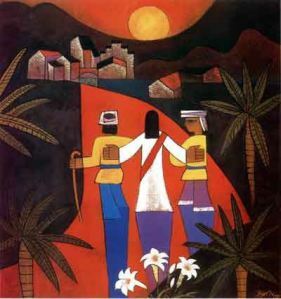 Imagine you are traveling on the Road to Emmaus just after the death of your beloved friend Jesus. You are sad, disappointed, angry and hurting because the One you believed, who would free your people from the Roman oppressors, is dead. You and your friend just had to get out of town to get away from everything so you could think straight again. You keep asking yourself, how the Messiah could be killed on a Cross just like a crook. You begin to wonder if Jesus was really great. Were you taken advantage of? Your mind is a mess. You just need some quiet time to talk with a friend. You want to run away from your problems. Imagine the story through the disciples’ eyes. We are out on the Road to Emmaus. We come across this fellow and we begin to talk with him. We can’t believe it but he doesn’t seem to know anything about what happened in Jerusalem. So we explain to him what has happened and how shocked and upset we are. But then to our surprise he goes on to explain through the Scripture why this would have happened. We are astounded by what he says. He is about to go when we invite him to join us for a meal. Then as we share a meal together we suddenly realize it was Jesus we were talking to. The moment we realize this he disappears. By this time our hearts are on fire and we get back to Jerusalem as quickly as possible to tell our Good News. Yes, Jesus has risen and the movement for social change is once again on the move. Many of us, when we get down, get stuck in our distress just like the two people on the Road to Emmaus. It often takes something shocking to wake us up into seeing the situation as it really is. For the travelers this was the realization they were talking to Jesus. Not only did they get stuck in their distress, but they wanted to run away from their problems and from their pain. They wanted to get as far away from Jerusalem as possible. There is so much to run away from today. We face violence, environmental degradation, racism, homophobia, greed, wars, materialism and more and it is so tempting to run away from all our problems, often through getting caught in addictions. Addictions such as alcohol, drugs both legal and illegal that briefly hide our pain and fear. Addictions such as consumption that feed our endless hunger for more. But Jesus offers us another way to live in the world. Jesus reminds us over and over again how we are not alone. The holy is never far away and can be found in in our bodies, minds, and hearts and in the whole creation. The only way I can express this is through a metaphor. I like the image of a tree as a powerful metaphor. The tree is solid, yet flexible, its roots reach into the earth for its nurturing, and its leaves soak up the solar rays that are synthesized into food for the trees and oxygen for us to breathe. The tree when it is healthy provides shelter for animals and birds and people. The tree when it is healthy produces fruit that gives life for many creatures including ourselves. I believe this is how God intended for us to live on planet earth with each other. God is like a great conductor or coach who guides is into living in harmony with each other so we can all be at our best. Do you have strong roots into the earth that keeps you grounded and self-aware? Are you connected to the longings of your heart? Can you feel the radiance of the sun on your head? Can you feel the wisdom of the holy throughout your body, mind and heart? Can you feel the wisdom of Jesus in the earth and in the heavens? When you experience this kind of union with the divine our addictions begin to disappear. All we need to live is all accessible to each of us. All we need to do is to be open to the Spirit and feel it, catch it, ask for it, and/or mediate on it. All we need to do is to live in community, just like we do at Foam Lake United Church; to be there to support, encourage and challenge each other into being all we can be. The Spirit is so present when we intentionally manifest the Kindom of God. How do you manifest the Kingdom of God? I invite each of us to look for Jesus in every person we meet. Each of us are beautiful human beings. Each of us are blessed with Divine gifts which we are called to share with the world. Often this comes as a surprise to us because too often we are own greatest critique. While I know at some level I am a good minister. While I realize that my sermons might be meaningful to people I still was surprised that people who, had never met me in person, expressed appreciation for the sermons they read on my personal blog. I was astounded that people from a diverse background were finding my messages helpful and life giving. Maybe you feel that way sometimes. Others are often better able to see our gifts than we can ourselves. Too often we undervalue what we can offer the world. Know that you are precious! Know that God loves you for who you are. Know that Jesus will walk with you for the rest of your lives and into the next the realm. Often we find Jesus in the least expected places. We are surprised to find Jesus in people that we don’t feel comfortable with. Who are the people you have experienced Jesus in? I have met Jesus in Gay, Straight, Bi-Sexual, Trans-gendered and Two Spirited people. I have met Jesus in many different races, nationalities and religious groups. I have met Jesus in people who I totally disagree with. I have found the best way to recognize Jesus in those I meet is over a meal, just like Jesus did with these travelers. Often at a meal we are more relaxed, we take time to get to know each other, and we look into each other’s eyes. It becomes a holy and sacred time. Some of my best memories are at meals with people whether I know them or not. Take a moment to recall some of those meals that were sacred for you. As well, when we shared the Peace of Christ with each other today, we were recognizing that of Jesus in each of us. For me the sanctuary is bubbling with love when we take the time to acknowledge the sacredness of each person. I end with this challenge to find Jesus in every person we meet with this week. Don’t rush through your meals. Take the time to open up with each other. You will be blessed! The world will never look the same again.